ABOVE: Creator Lin-Manuel Miranda (center) in the original Broadway production. Photo by Bruce Gilkas / Film Magic & Getty Images. 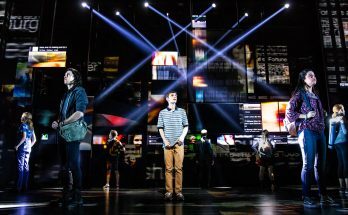 Broadway in Atlanta announced Monday that the Tony Award and Pulitzer Prize winner will return sometime in the 2019/20 season. No other details were available. The show just finished a three-week run at the Fox. The touring company that Atlantans saw is now in Washington, D.C. 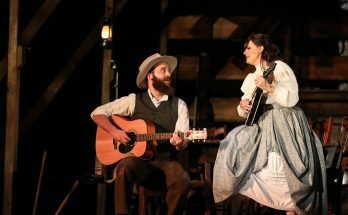 The Broadway show, which opened Aug. 6, 2015, is closing in on its third anniversary and still playing to sold-out houses. It’s filling the Richard Rodgers Theatre at a 101.6 percent clip, according to the most recent box office figures. Lin-Manuel Miranda’s masterpiece (he wrote the book and score and was the first actor to play Alexander Hamilton) won 11 Tony awards, including best musical, and the 2016 Pulitzer Prize for Drama.